It's Facebook Fridays! for February 27, 2015 -- and if you sometimes feel like the Cowardly Lion in the Wizard of Oz, then this is the week to roar out your courage and get the nerve to face down your demons! 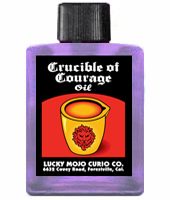 The Lucky Mojo Curio Co. is hosting a random drawing to give away 3 fear-breaking Crucible of Courage spiritual supply prizes designed to boost your ability to stand up and go for it! 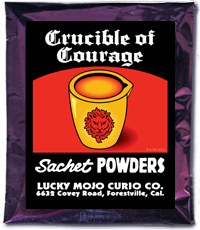 This week the prizes are three Crucible of Courage Power Packs, each complete with a bottle of Lucky Mojo hand-made Crucible of Courage Dressing Oil, and one foil-packet each of our hand-made Crucible of Courage Bath Crystals, Incense Powders, and Sachet Powders. First thing tomorrow morning, we will select THREE winners at random, and ask them to message this Facebook Page with their mailing addresses, so we can send them their FREE Crucible of Courage products. Thanks, Ernie. Folks, click the link and enter the contest, and maybe you will win! We have a winner! In fact, we have 3 lucky winners! Our Facebook Fridays! winners for February 27, 2015 are: Brad A Morlan, Anita Perez, and Margie Levangie.